Over a six-month period, 1265 BruxZir Solid Zirconia Crowns and Bridges restorations were recalled out of 2112 total restorations placed. Among the recalled restorations, 49% had been in function for up to three years, 28% up to five years and 23% for over five years (Figure 2). The majority (81%) of restorations were fabricated by Glidewell Laboratories, while the remainder (19%) were fabricated by Apex Dental Milling. 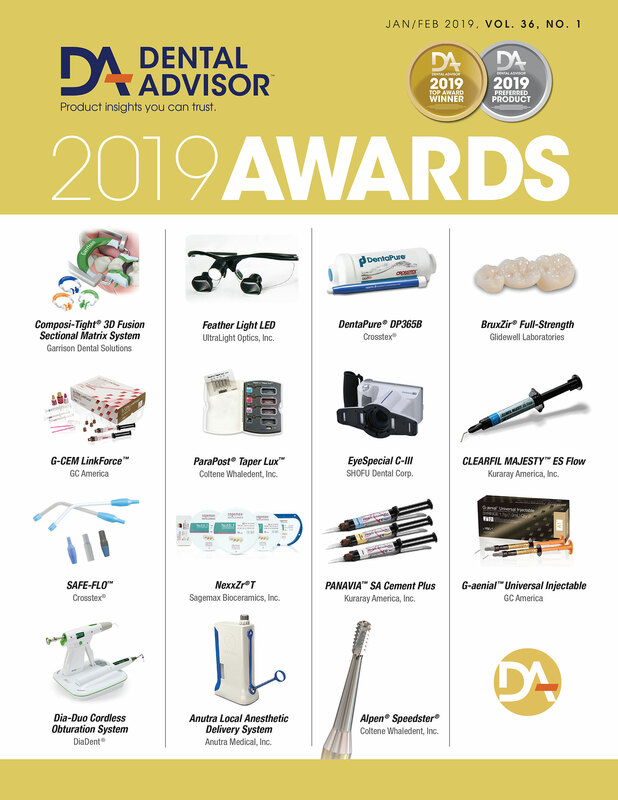 BruxZir Solid Zirconia Crowns and Bridges restorations were evaluated in the following categories: esthetics, resistance to fracture/ chipping, resistance to marginal discoloration, wear resistance of the zirconia restoration and opposing dentition, and retention. The restorations were evaluated on a 1-5 rating scale: 1=poor, 2=fair, 3=good, 4=very good, 5=excellent. 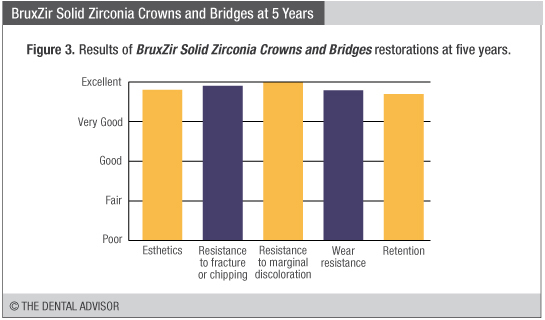 The esthetics of BruxZir Solid Zirconia Crowns and Bridges restorations was rated excellent (Figure 3) based on the consistency of the shades and in comparison to other monolithic zirconia restorations. Zirconia restorations are generally opaque and lack translucency and opalescence. BruxZir Anterior is definitely more translucent and still has high flexural strength. The esthetics of zirconia restorations is not comparable to esthetic ceramic restorations resulting from incremental buildup but it is improving. BruxZir Solid Zirconia Crowns and Bridges restorations are perfect for patients desiring more uniform, whiter teeth (B1 shade). The new BruxZir 16 recently introduced by Glidewell Laboratories has improved esthetics. Chipping and fracture of BruxZir Solid Zirconia Crowns and Bridges restorations has been practically non-existent (Figure 3). Only three fractures have been observed. A 2nd molar crown fractured; it was likely the result of insufficient occlusal clearance and reduction. Two implants crowns on lower second molars also fractured and were replaced. Their fracture was probably the result of very low clearance and insufficient space due to implant placement. Having less than 1 mm clearance is not recommended for molars, especially second molars. None of the three- or four-unit bridges fractured. Two five-unit bridges fractured and were replaced with PFM bridges. In both cases, the clearance was minimal and the patients were heavy bruxers. Two six-unit anterior bridges were splinted teeth where not more than one or two adjacent teeth were missing. 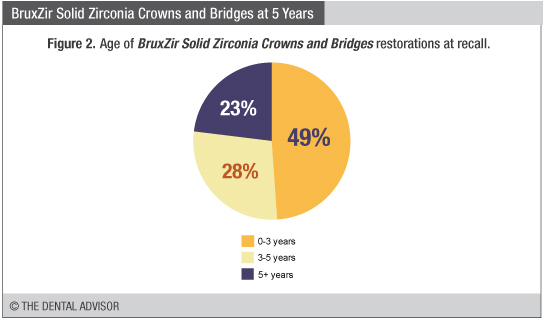 Only six (0.5%) of the BruxZir Solid Zirconia Crowns and Bridges restorations exhibited slight marginal discoloration at three to five years or more (Figure 3). The opacity of the crowns helps camouflage most staining or microleakage. Staining is more a function of the bonding agent and the cement used rather than the zirconia. If teeth are very discolored, it is advisable to use a more opaque resin for cementation. Almost no wear was observed on BruxZir Solid Zirconia Crowns and Bridges restorations and minimal wear was observed on opposing natural dentition at three to five years (Figure 3). More wear was noted on gold crowns opposing BruxZir Solid Zirconia Crowns and Bridges restorations. 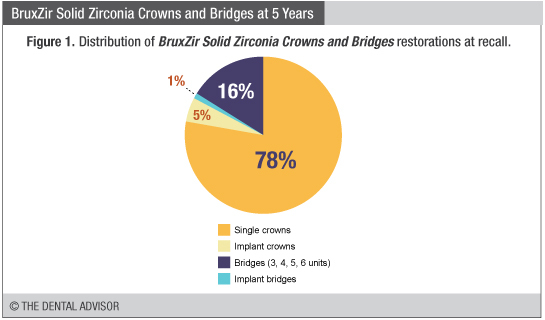 Sixty-three (3%) out of the 2112 BruxZir Solid Zirconia Crowns and Bridges placed debonded and required re-cementation over the five-year period (Figure 3). This debonding rate is slightly higher when compared to debonding of non-zirconia crowns (2%) that THE DENTAL ADVISOR has documented over time. It is advisable to prime zirconia crowns prior to cementation to improve retention. 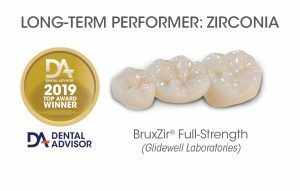 Over the five-year evaluation period, BruxZir Solid Zirconia Crowns and Bridges has proven to be an excellent restoration with respect to esthetics and dependability. It is highly recommended for posterior crowns and three- and four-unit bridges as well as implant-supported crowns and bridges. In select cases, in can be used confidently for anterior restorations. It received a 97% clinical rating.